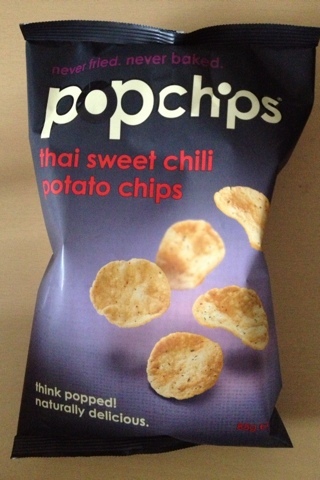 I was lucky enough to try out Popchips....Popchips are one of the fastest growing snack brands in america, and are now available in the UK... making it easier for snackers to spice up their snack life with the debut of its newest flavour' - Thai Sweet Chili. Never fried. never baked. Popchips are popped with heat and pressure to make a naturally delicious crisp with all the flavour and less than half the fat of fried crisps, fewer calories and none of the fake colours or flavours (or greasy fingers) that gives snacking a bad name. Thai Sweet Chili is available in Waitrose exclusively... in a handy share bag size (85g) rrp £1.89. Thai Sweet Chili joins five taste-bud popping flavours already available in store, including original, Barbeque, Salt & Vinegar, Sour Cream & Onion and Salt & Pepper. We all loved the popchips they were very tasty and didn't last very long in our house...every bite filled with a a mild Chlli flavour with a hint of sweetness...I'm always on the look out for an heather snack alternative..and really loved these. They contain less then half the fat or regular fried crisp no cholesterol saturated/or trans fats which is amazing.